This is the Easiest Ever Raspberry Dip for fresh fruit and it is the tastiest too! No need to pull out all kinds of fancy ingredients ... this dip is unbeatable and consists of only two ingredients! Note - You can easily substitute the raspberry yogurt with strawberry yogurt, or ANY other flavour of yogurt! To serve larger numbers of people, I simply double or triple this recipe! Easiest and BEST Dip for Fresh Fruit! Try it once, and you will be sure to be preparing this over and over again! 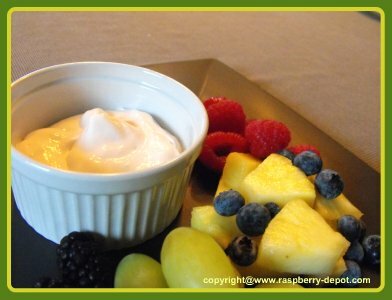 This is the only fruit dip recipe I now use when I want to make fruit dip for a snack, and to serve my guests. Making your own fruit dip really cannot get any easier can it? Mix the raspberry yogurt (or other type) with the whipped dessert topping with a spoon until thoroughly mixed and well combined. Refrigerate for 2 hours before using. Be sure to store any unused dip in the refrigerator (for up to 5 days). Are you planning to make a homemade fruit platter to take to an event, or for use at home? Here are pictures and instructions for how to make an easy fruit tray at home. Homemade fruit platters are much tastier, fresher, and a frugal food idea! Most people know that raspberries, and other berries such as strawberries and blueberries are very nutritious. However, did you know that raspberries and other berries are also packed with antioxidants? Antioxidants are important for the body to prevent and repair oxidative stress, a process that damages body cells and has been linked to the development of diseases such as cancer, heart disease and Alzheimer's disease. So, including berries in your diet is a very good idea!